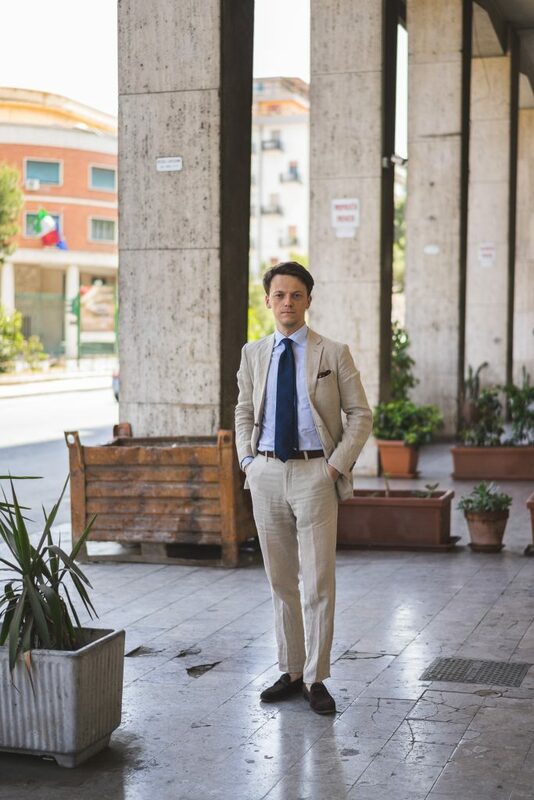 Vecchio Anseatico and Blue Loafers collaboration for spring/summer tie collection. 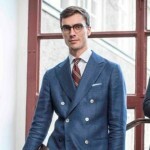 Steffen (founder and owner of Vecchio Anseatico) and I first met at winter Pitti in Florence this winter. We have spent significant amount of time together as both of us were staying in Italy for about a week. Having the hotels not far from each other certainly helped too. 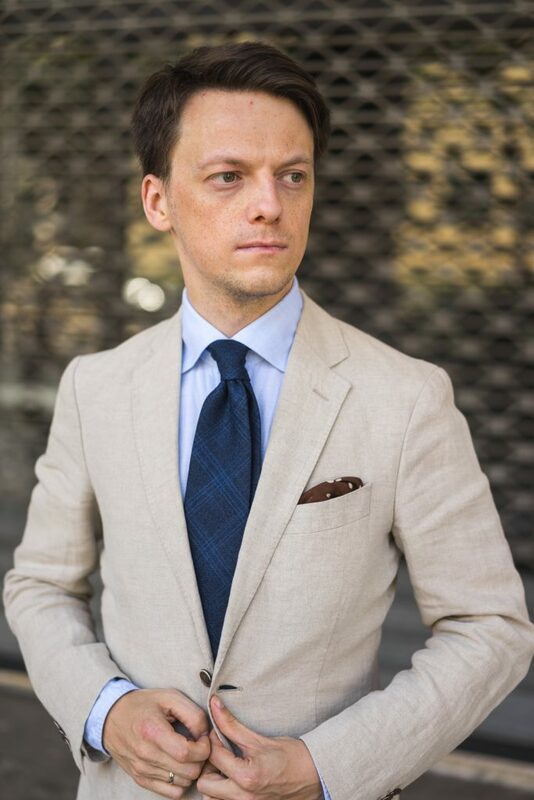 I have known him from social media before that and was always impressed with his fabric choices for Vecchio Anseatico ties. There are so many accessories brands on the market nowadays so it is very difficult to distinguish yourself from others. 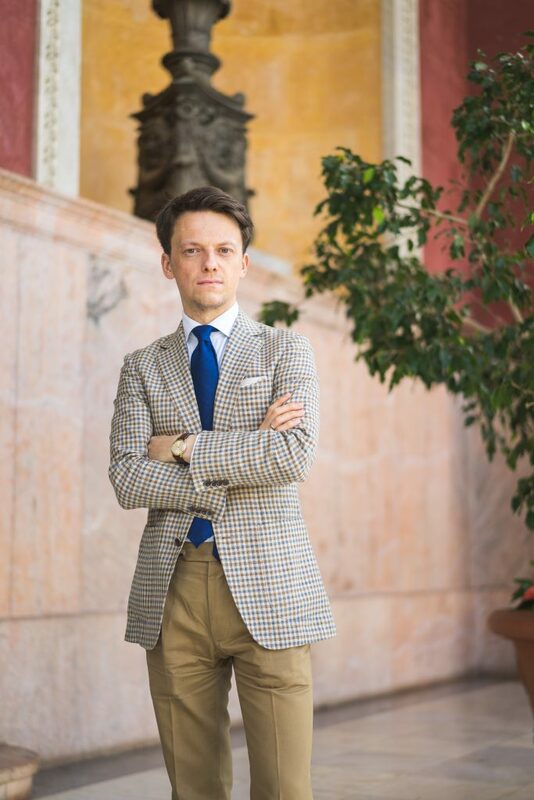 Steffen has particularly good eye to fabrics that make for amazing ties. Something that good designers have and you don’t appreciate it until you see the final product. One thing let to another and he offered to make a collaboration in a form of a small collection of ties “selected by Blue Loafers”. It is an amazing opportunity that I am very grateful for. 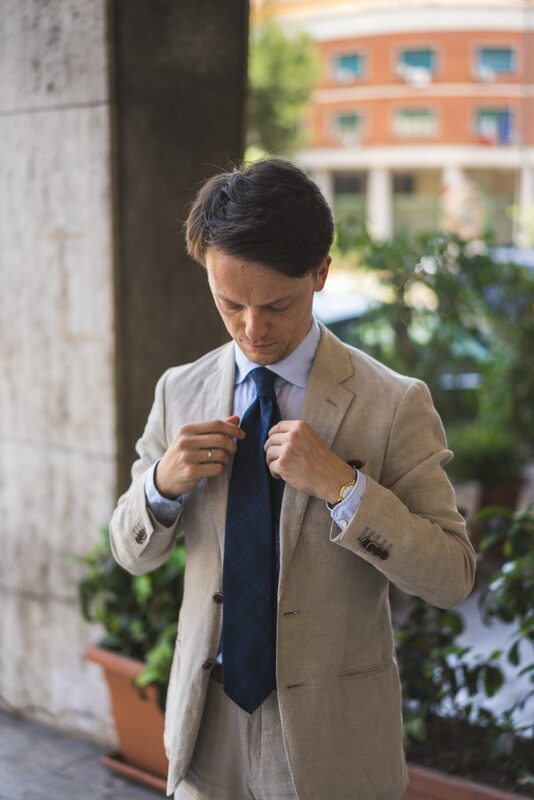 At the same time I felt excited to be able to select my own ties for Spring/Summer 2018. 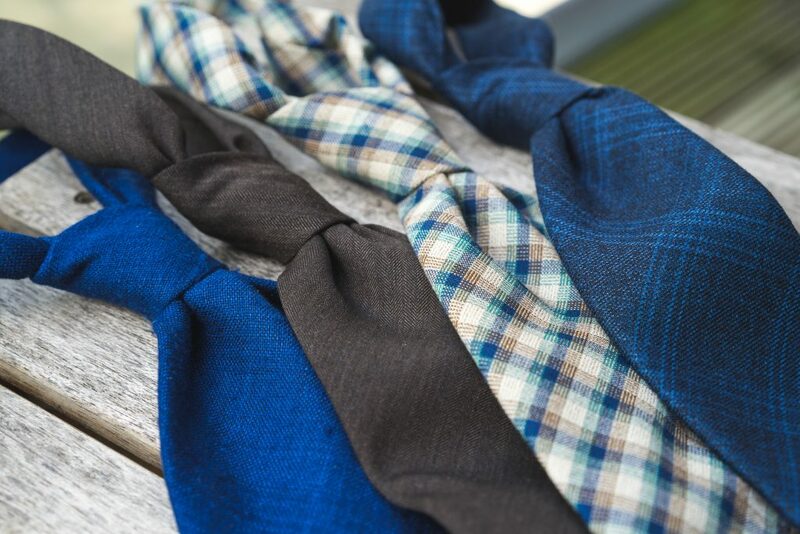 All the ties are in 3-fold construction using medium weight interlining. Hand crafted in Como region in Italy. 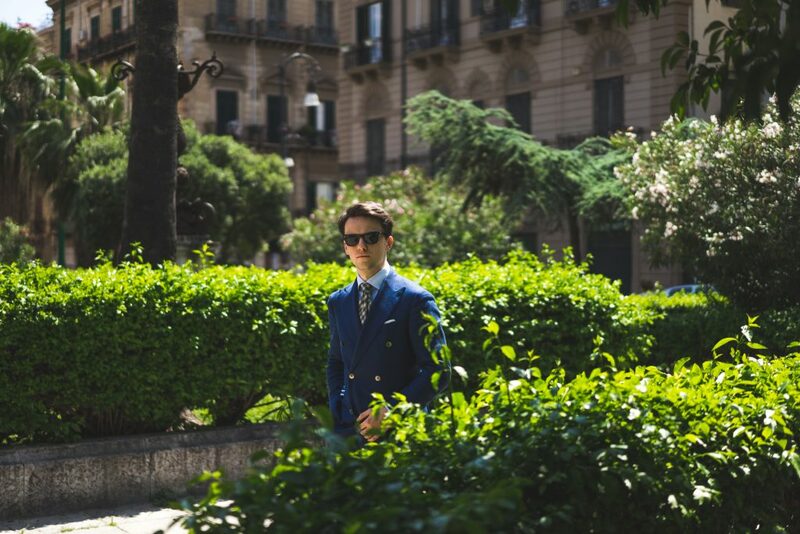 Once the collection was ready we decided to go to Sicily and shoot the ties around the beautiful and exotic city of Palermo. 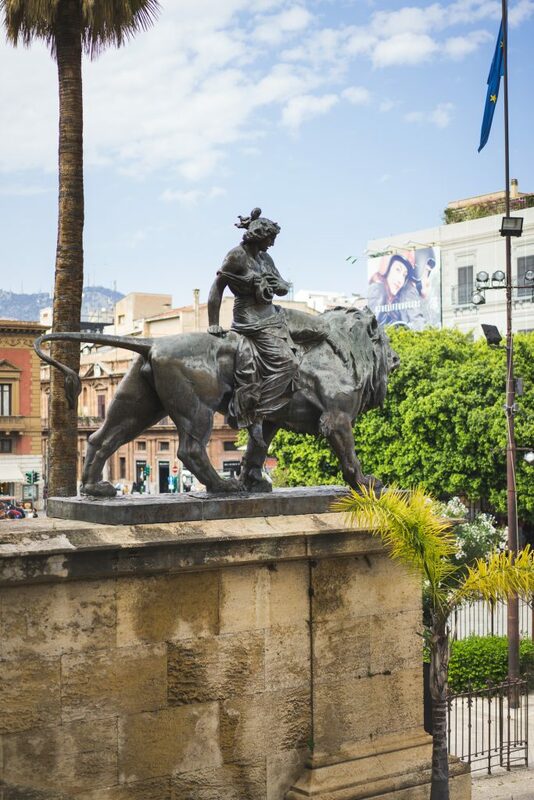 What an amazing place and suited us perfectly with its sunny weather and North African influences on architecture. First of the collection is this Cobalt Blue Ashoka Silk tie made of 100% Woven Indian Ashoka Raw Silk. It has a beautiful raw silk appearance. It is a bit finer than shantung, not as fluffy. 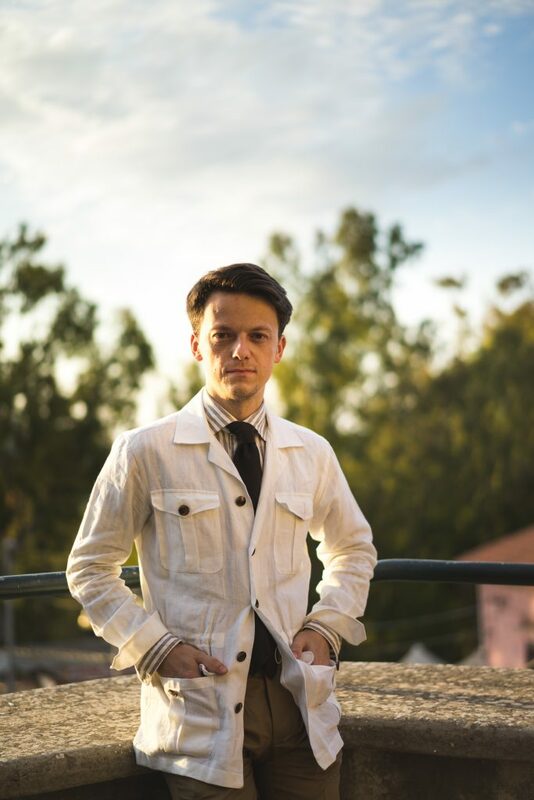 I paired it with a gun club sport coat in lightweight wool/silk/linen mix. 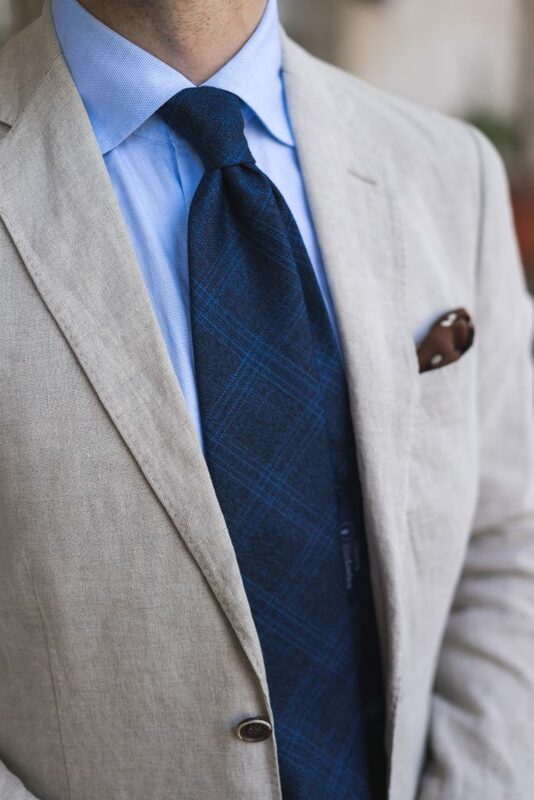 The cobalt blue tie brings the check up and with a white cotton/linen shirt it has just enough contrast. 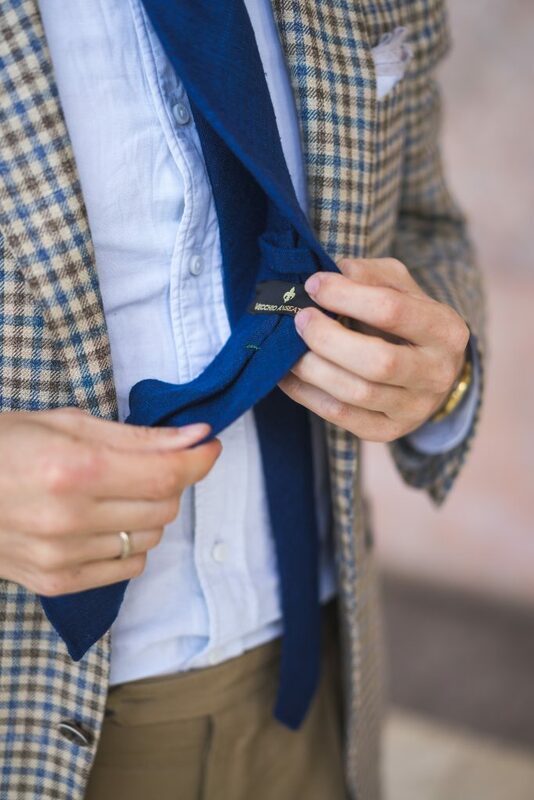 The tie has a medium-weight lining inside which allows for moderately big yet firm knot. The texture of the fabric will ensure it does not loosen up during the day. The fabric is also loosely woven so the untipped end with hand rolled edges makes for a really stylish feature. This must have been the first fabric we selected. 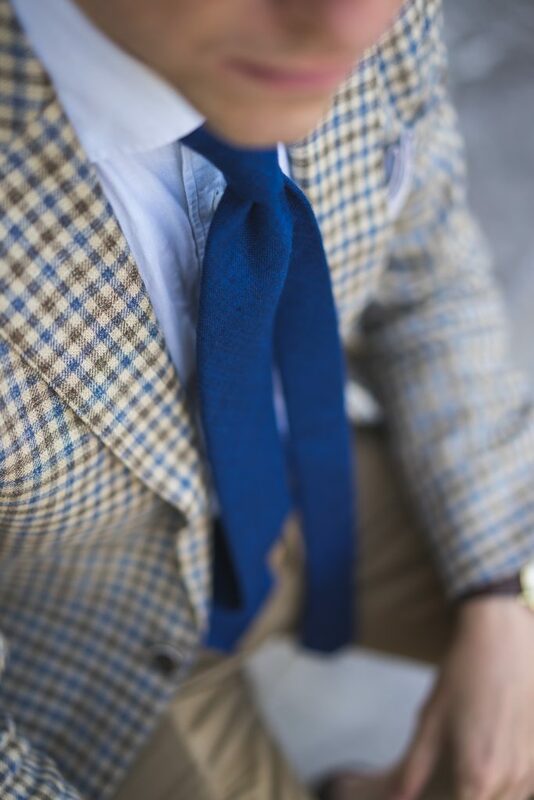 I immediately was drawn to this Holland & Sherry Sand “Vintage” Check Wool tie it because of the vintage-like look. It reminds me of the Kenji Kaga’s Seven Fold ties or Brycelands ones. They are matte and “dry” but offer interest in a form of colour and texture. 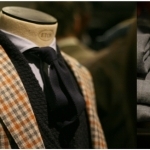 It is quite unusual nowadays to offer ties in clothing-like fabrics but this Holland & Sherry 100% worsted wool proves that it works. 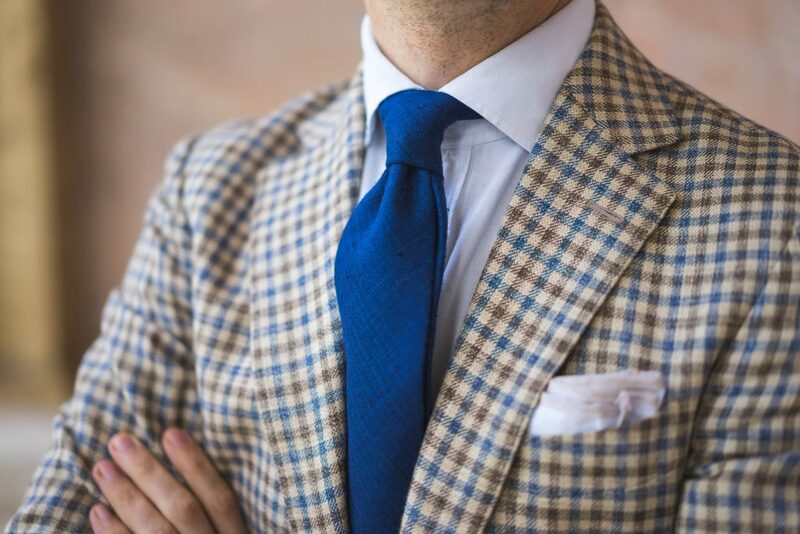 I would love to show you this tie paired with beige cotton suit that I have in the make. It is not finished yet so I promise I will do as soon as I can. 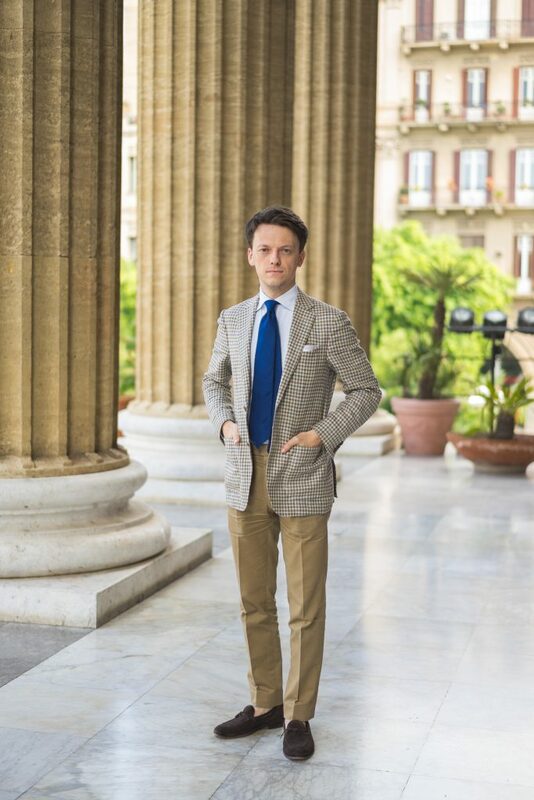 In Palermo I paired it with blue hopsack double breasted blazer, micro-houndstooth pale blue shirt and linen trousers. As you can see all the fabrics work well together because of their textures. 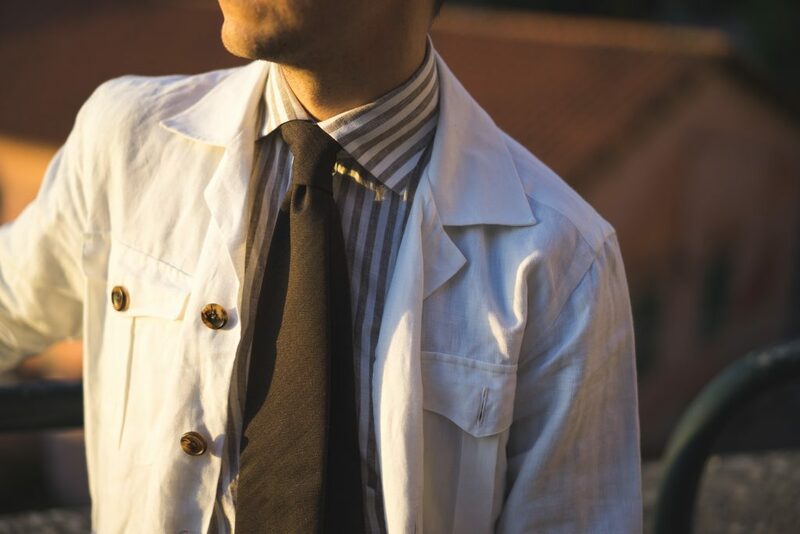 The tie corresponds to beige trousers and balances the contrast between darker blazer and lighter shirt. 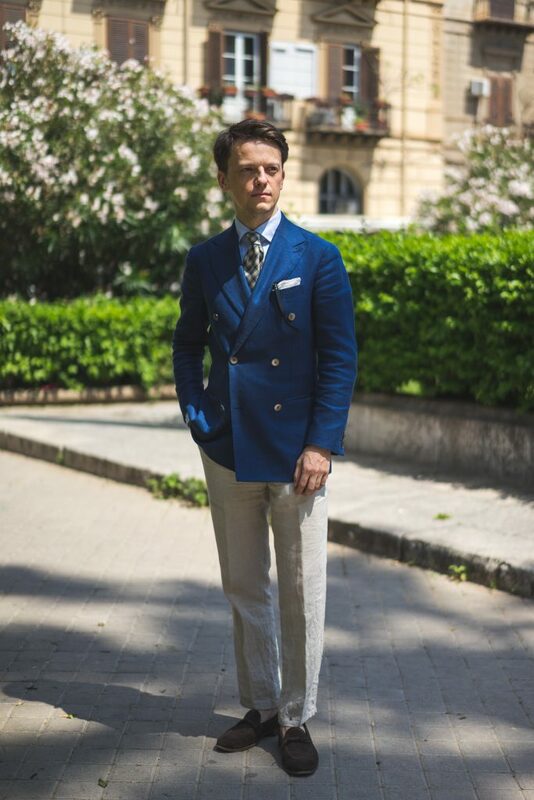 Everything is well worn here, starting with trousers, shoes and the jacket. 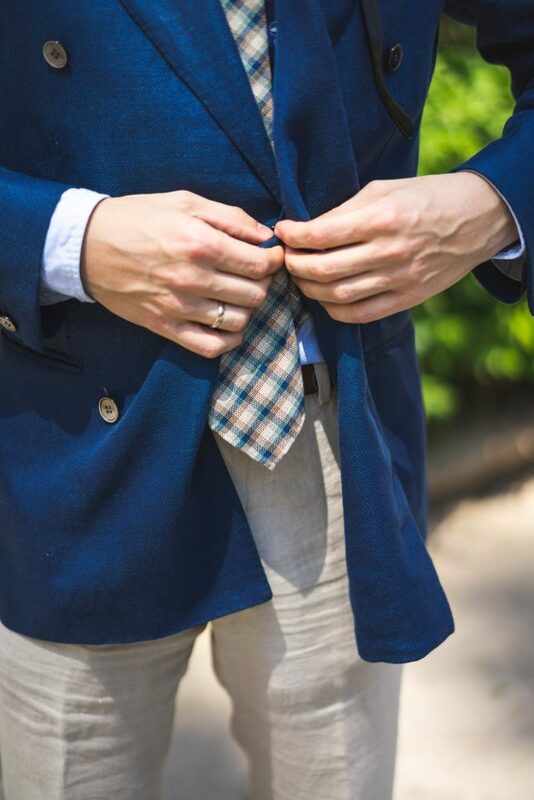 The checked tie blends in well and is in perfect harmony. It is very easy to pair with anything in classic colours and that’s probably its biggest strength. 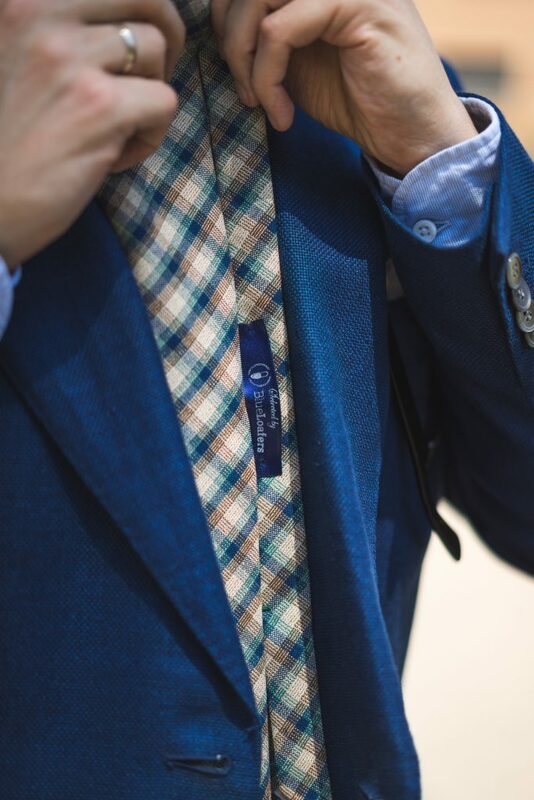 Another tie from our Vecchio Anseatico and Blue Loafers collection is the Fine Worsted Navy Checked 100% Bamboo tie. 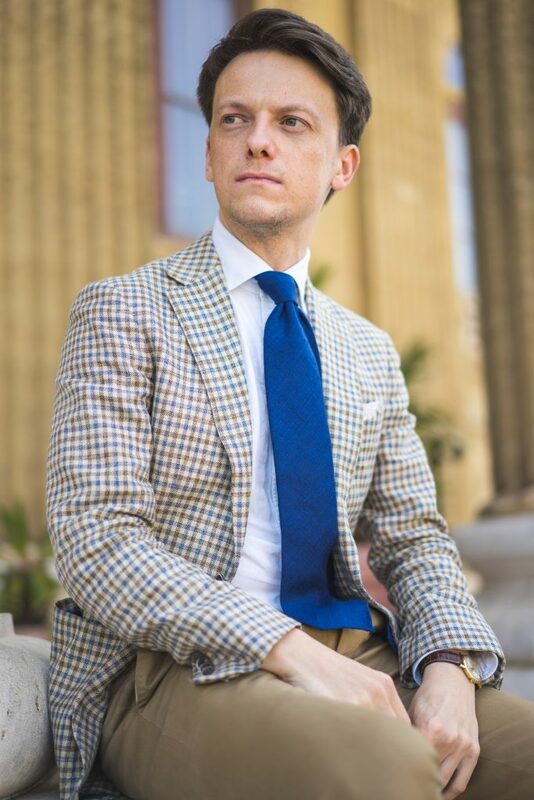 Twill weave and windowpane check make it possibly the most “formal” of the bunch and in my conservative opinion it is best suited for the wear with a summer suit. Bamboo from Huddersfield is lovely, very soft and has a slight shiny to it. 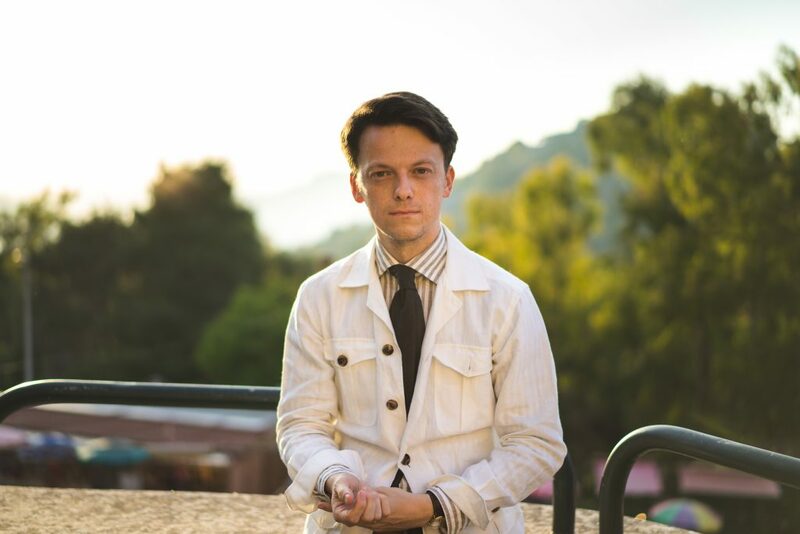 This is probably my most Italian imitation with a beige linen suit, pale blue mini-houndstooth cotton-linen shirt and navy checked Bamboo tie. I love how subtle the check and only comes to life from up close. This for me is the very important aspect of style. You don’t want to scream “I am stylish, look at me and all the colours”. The classic and tasteful combinations with just a little bit extra features like unusual fabric (Bamboo) or subtle check will go a long way. 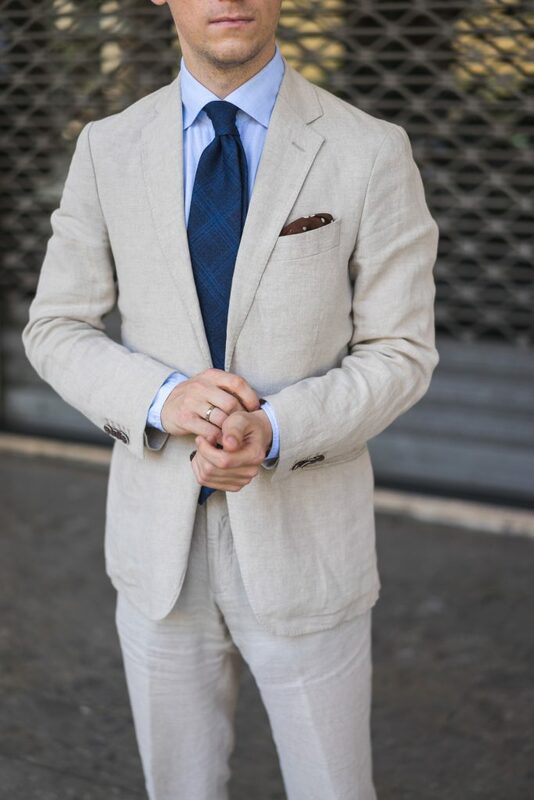 An interesting addition to this look is a dark brown polka dot pocket square. Also, how lovely is the collar on this shirt! Last but not least brown herringbone worsted wool tie. 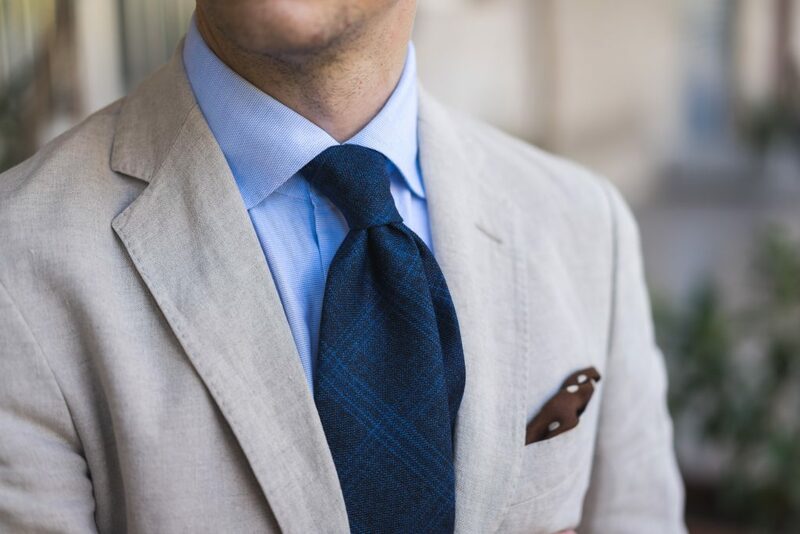 Shade of brown in this tie is just perfect for any summer colour, starting with blues, whites, beige and olive greens. If you look around Italian cities it is everywhere. The texture of the herringbone as highlighted by the late afternoon sun in Southern Italy. 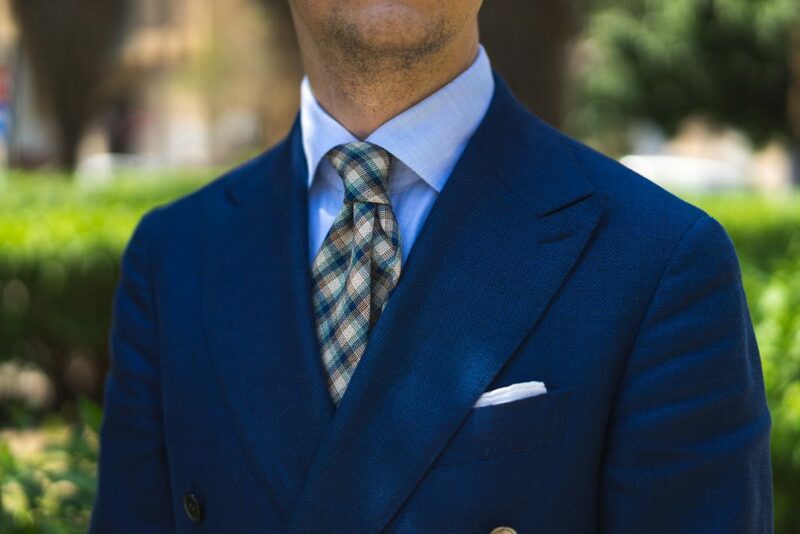 Again, this is very simple, but classic and hence tasteful combo. 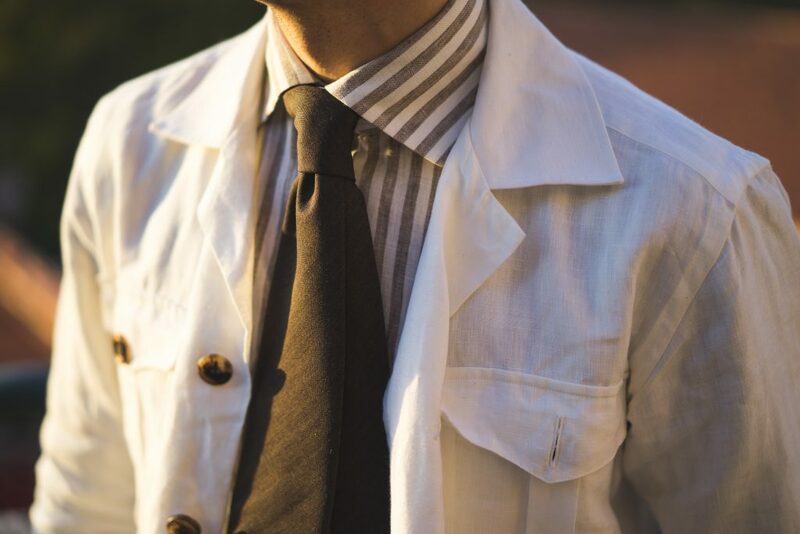 Sahara-brown striped cotton-linen shirt worn with white linen safari (by BnTailor). 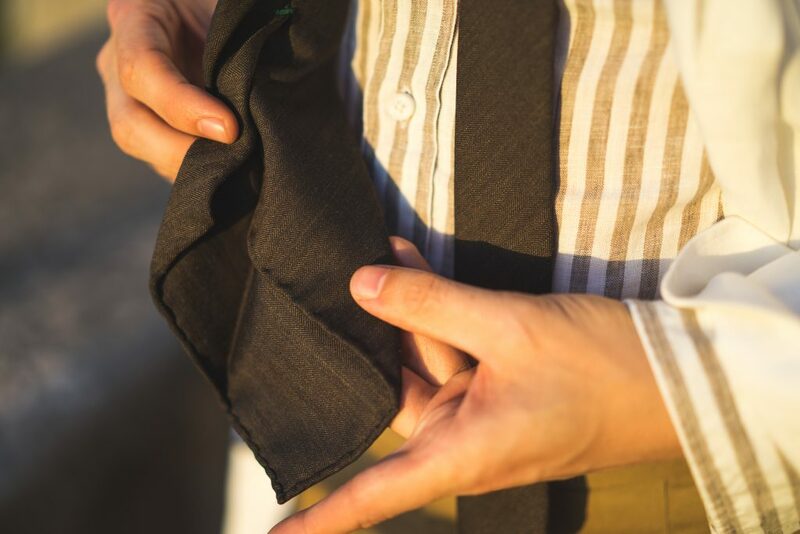 Lightweight worsted wool works very well in this untipped tie. The tip has not been pressed very much to allow the tie to have more 3D form. 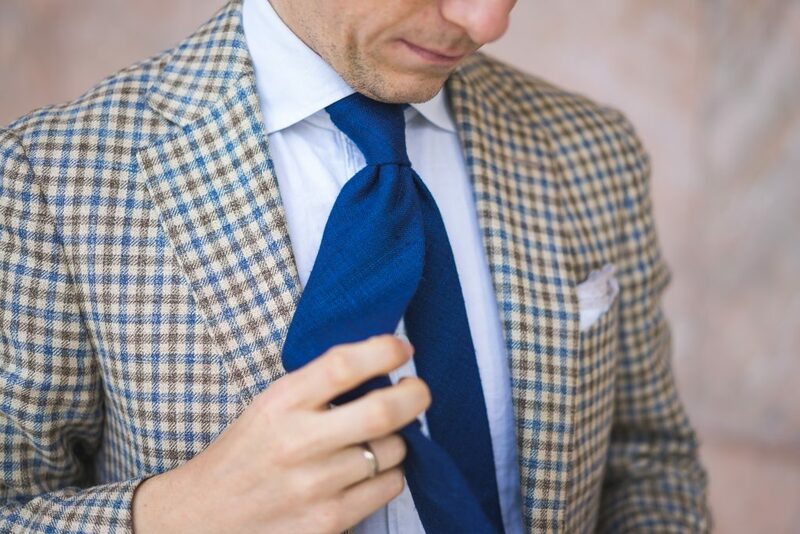 Another perfect scenario for this brown herringbone would be a navy hopsack jacket or navy Fresco suit. The textures of both fabrics would work so well. 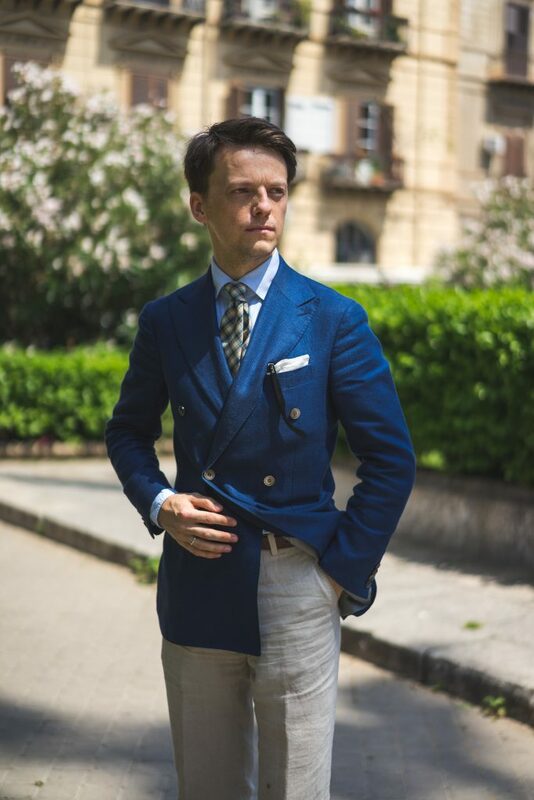 At a first look it is relatively formal but at the same time as worn with khaki chino and white safari it also proves to work very well in the most casual look of all here. That is the strength of classic colour! What I love about Steffen and Vecchio Anseatico is how unique all of the ties are. They are all well made in small workshops in Italy and do not cost a fortune. This is a perfect example of collaborations I would like to do and brands I would like to support: great value for money, interesting, made by people with passion and stylish. 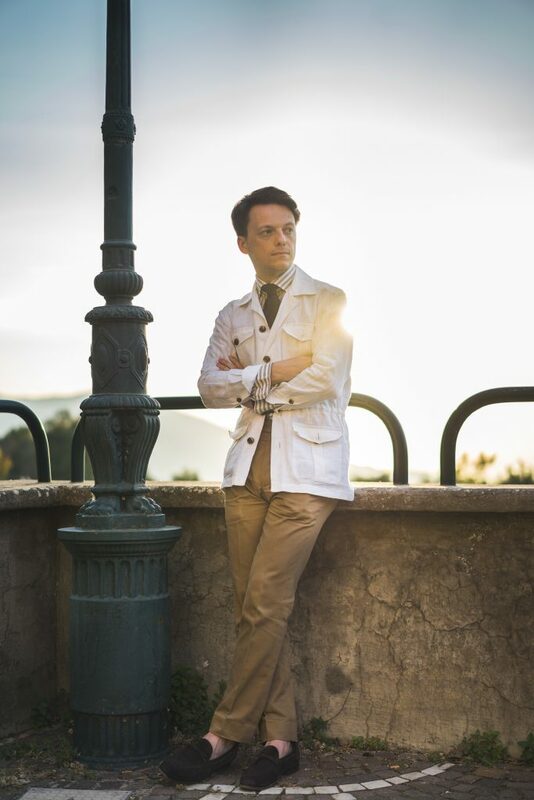 Vecchio Anseatico and “selected by” Blue Loafers collection is a combination of the brands approach to using unusual fabrics and my classic way of dressing. 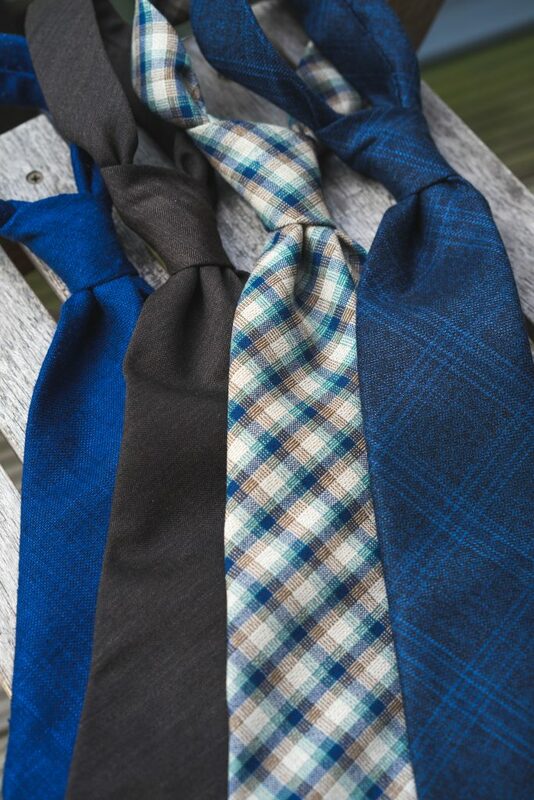 I hope I showed you those four ties in a very true and personal way which you can relate to. It is a very wearable and coherent collection that works just as well together as individually. 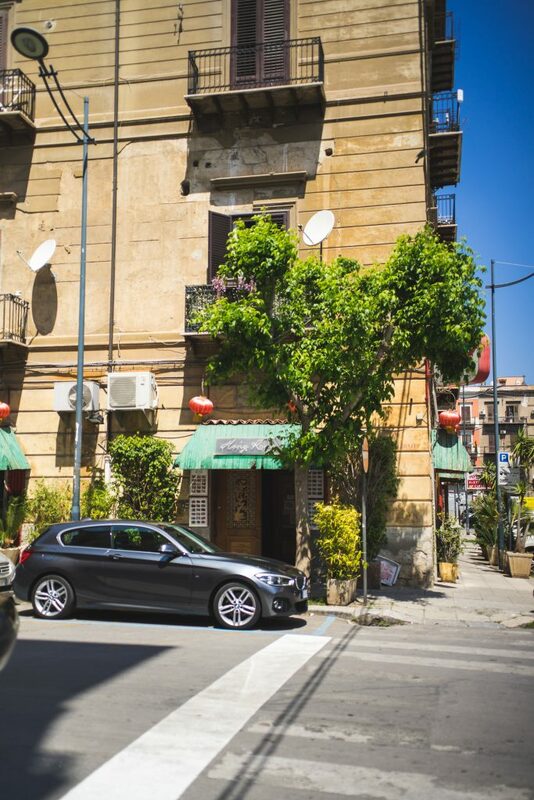 Please see more photos below from our trip to Sicily!